Comic book interjections like “Bam! Kapow! Thwack!” are classic examples of English onomatopoeia. But if Superman were to come up against a Japanese superhero, he’d probably be KO’d by his rival’s sheer arsenal of sound effects. Japanese is a language extremely rich in onomatopoeia. These giongo and gitaigo, mimetic words which describe not only sounds but also more abstract concepts like blushing (“dere-dere”) or the sensation of a gentle breeze (“soyo-soyo”), are usually made up of two sounds or syllables which are repeated for emphasis. And while an online list of English onomatopoeia has only 757 examples, the Japanese giongo/gitaigo dictionary boasts a whopping 4500 entries. One area where the onomatopoeia get strangely specific is when you’re talking about food texture. Take what English speakers would simply call “crunchy”—in Japanese there’s shaki-shaki (crunchy and juicy like a green apple or iceberg lettuce), pori-pori (a quieter munch, like cookies or Pocky), pari-pari (a crackly crunch like nori), saku-saku (a light, crispy crunch like tempura coating), kori-kori (soft and crunchy like broccoli), kari-kari (a dry crunch like toast or biscotti), and gari-gari (hard and crunchy like carrots or ice). If all this is making you feel a little peko-peko (the sound of a rumbling stomach), allow us to serve up 15 more linguistic morsels to sink your teeth into. 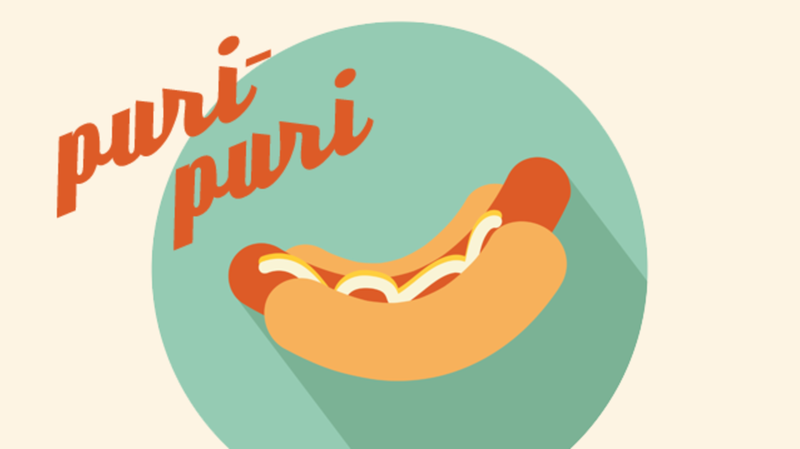 Puri-puri describes that feeling of snapping into a fresh shrimp or a plump hot dog. Bursting with juiciness and bounce, puri-puri evokes the springiness and slight resistance of collagen—which is why it’s also sometimes used to describe a young girl’s cheeks. You know when a soft morsel of hot baked potato crumbles on your tongue and your mouth fills with a starchy steaminess? That’s hoku-hoku. Fuwa-fuwa is one of the cutest of the food onomatopoeia, often squealed by girls to describe delightfully light and fluffy foods like white bread, marshmallows, or pancakes. Fizzy and bubbly, shuwa-shuwa refers to the refreshing mouthfeel of a carbonated beverage like sparkling water or champagne. We would probably never want to describe a food as neba-neba (slimy) in English, but it’s high praise in Japan. That’s because the Japanese lap up such gooey, viscous—or more technically, mucilaginous—delicacies as nattou (fermented soybeans), wild yam, and okra. Mochi-mochi is the most meta of the onomatopoeia, as it comes from one food in particular: mochi. If you’re not familiar, that’s sticky rice pounded into a stretchy, chewy, glutinous ball. Mochi-mochi isn’t just limited to the ice cream-filled sweet, though—it can also describe a particularly dense, doughy bread. Puru-puru seems like the perfect word to describe a blob of wobbly, wiggly gelatin. People with trypophobia dare not do a Google image search for tsubu-tsubu—this handy term is used for clusters of tiny balls, seeds, or grains. Food-wise, that means sprinkles, caviar, Dippin’ Dots, or, the staple of Japanese desserts, sweet adzuki beans. Giongo aren’t always appetizing; you can use pasa-pasa to talk about a food that’s lost all its moisture and flavor, like leftover rice that no longer sticks together, a dried up old orange, or stale bread. Toro-toro describes rich, creamy fare that has melted from a solid to liquid—think grilled cheese, chocolate fondue, or a slow-cooked stew brimming with fat. How about some ramen? You’ll want the noodles to be both tsuru-tsuru (slippery) and shiko-shiko (al dente). If they are, you’re sure to gobble them up with a loud zuru-zuru (slurp)—unless you’re a woman, in which case you might go churu-churu (a more feminine slurp). Just be careful not to get broth all over your face or you’ll be gido-gido (oily). That’s a mouthful! Surely by now you’re pan-pan (stuffed).